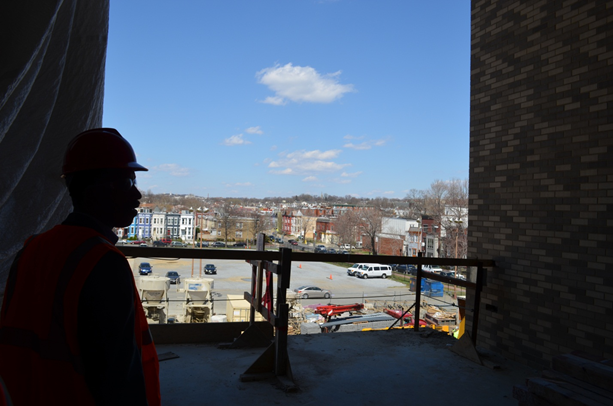 On April 3, Councilmember McDuffie attended a hard hat tour with the Department of General Services (DGS) to see the new Paul Lawrence Dunbar Senior High School. The new 280,000 gross square footage high school will support the students’ educational needs and foster a professional teaching community. Four distinct learning academies, featuring technology-rich laboratories, classrooms and collaborative faculty workspaces, will occupy the four floors of the academic wing. 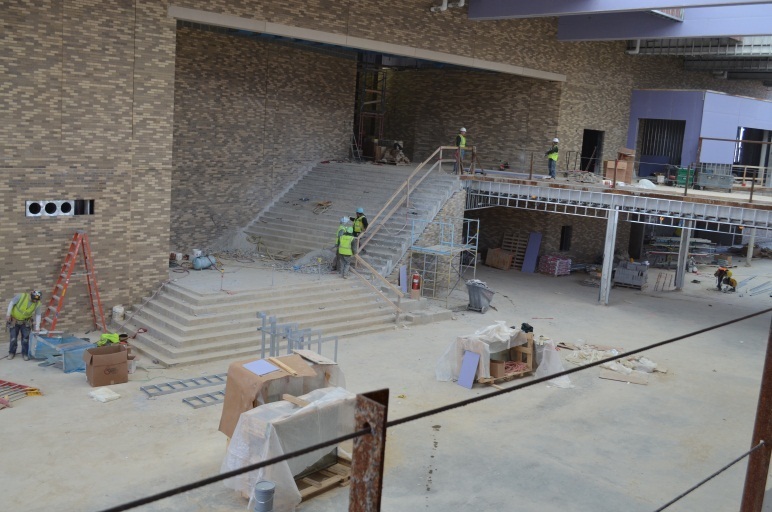 Additionally, the new Dunbar High School will have a centrally-located media center with great views of Ward 5 and will house a performance theater, pool and a competition gym to provide enhanced programing. The new Dunbar High School will also reconnect the school to the surrounding Truxton Circle neighborhood. With a south-facing entry plaza, tower and large windows, the building will visually engage the adjacent Dunbar Recreation Center and represent the school to commuters traveling on New York Avenue. The new school is slated to be completed later this summer. 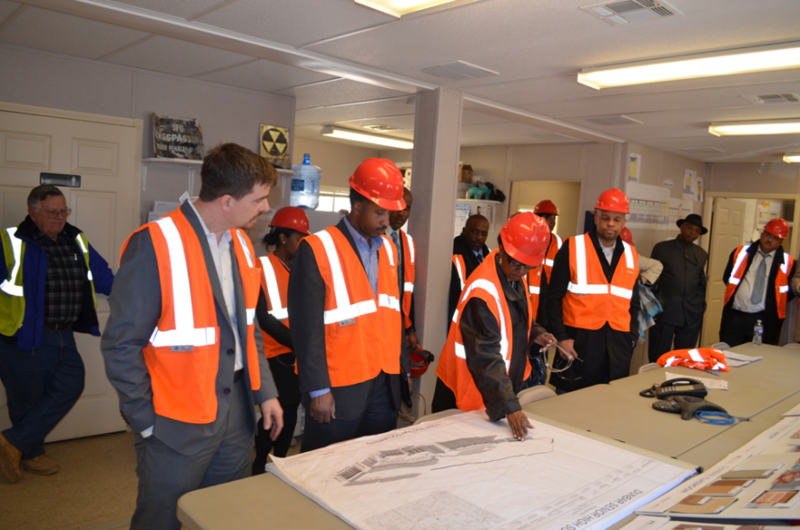 Click here to view additional pictures from Councilmember McDuffie’s tour. For more information on the construction of the new Dunbar High School, visit www.dgs.dc.gov. Councilmember McDuffie meets with the Office of Campaign Finance (OCF) to discuss their needs around comprehensive campaign finance reform. OCF regulates the conduct of political campaigns and government officials who are elected and appointed to public office. 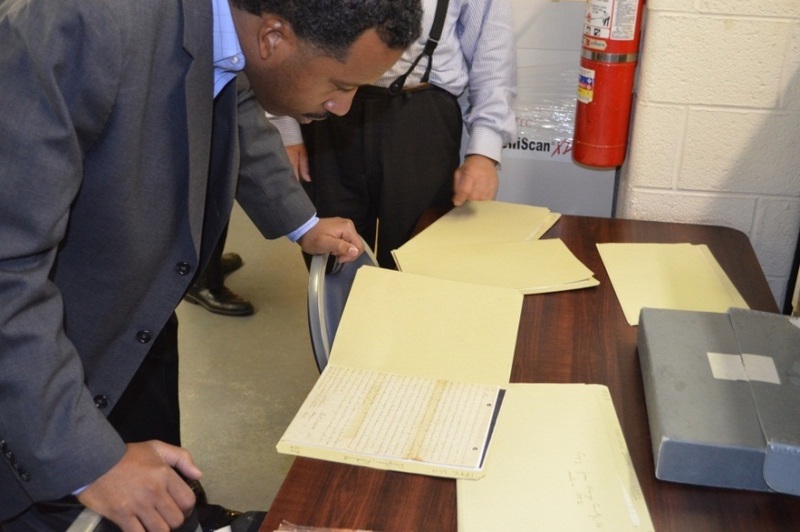 Councilmember McDuffie examines Frederick Douglass’ will at the DC Archives. The DC Archives holds historical and permanently valuable records of the DC Government such as birth and death records, wills, land records and marriage records. Historic records on file include the original wills of Alexander Graham Bell, Francis Scott Key, James Madison, Dolly Madison, Woodrow Wilson, Oliver Wendell Holmes and Frederick Douglass, as well as Duke Ellington’s birth certificate. Councilmember McDuffie meets with staff from the Office of the People’s Counsel to discuss their programming and performance. The Office of the People's Counsel is an independent agency of the District of Columbia government. By law, it is the advocate for consumers of natural gas, electric and telephone services in the District. District of Columbia law designates the Office as a party to all utility-related proceedings before the Public Service Commission. The Office also represents the interests of District ratepayers before federal regulatory agencies. In addition to the above agencies, Councilmember McDuffie also visited the Board of Ethics and Government Accountability (BEGA), the Board of Elections (BOE), the Office of the Inspector General (OIG), the Department of Human Resources (DCHR), and the Office of Risk Management (ORM). 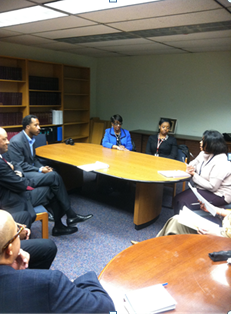 Click here to view additional pictures from Councilmember McDuffie’s tour. 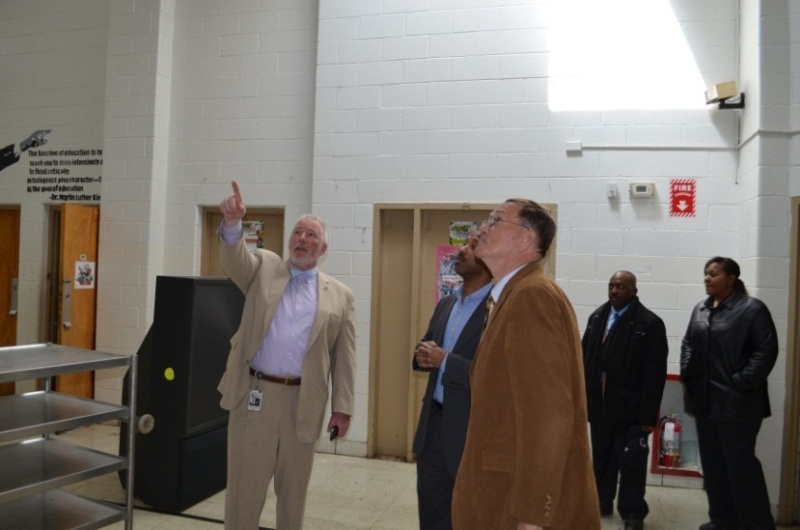 This week, Councilmember McDuffie convened a walk-through with DGS Director Brian Hanlon and DC Public Schools (DCPS) of the vacant Shaed Elementary School. The walkthrough allowed the Councilmember to see first-hand the condition of the school. Councilmember McDuffie is working with DGS and DCPS to develop alternative uses for the vacant property. This week, Councilmember McDuffie attended the Woodridge Civic Association meeting. During the meeting, the Councilmember greeted residents, outlined his agenda and heard community input on how his office could better serve the community. It is important to the Councilmember that he and his staff continue to engage the residents of Ward 5. Saturday, April 13 - New York Avenue Recreation Center, First Street and New York Avenue, NW, from 10:00 a.m. – 11:30 a.m. The Committee on Government Operations, chaired by Councilmember McDuffie, recently held the last of four public hearings on several campaign finance reform measures in the Committee. Advocates, government officials, campaign staff, and interested residents testified to the need for increased disclosure, accountability and transparency in the current system. The Committee will now transition to marking up the legislation with continued input from stakeholders in anticipation of a late-May Committee mark-up date. Additional comments should be submitted to Ronan Gulstone, Committee Director, at (202) 724-8028. Councilmembers McDuffie and David Grosso introduced a bill allowing breweries to sell their products on Sundays, subject to approval by the Alcohol Beverage Regulation Administration. Currently, breweries can sell bottled beer from their breweries Monday through Saturday. This legislation would extend Sunday sale privileges to breweries. Councilmembers McDuffie and Grosso, along with Councilmembers Muriel Bowser and Anita Bonds will also introduce a bill next week allowing breweries to conduct product tastings on Sundays. Currently, breweries are permitted to provide samples Thursday-Saturday. This bill would extend the sampling to Sunday. Mayor Vincent Gray announced a series of town hall-style meetings to provide an overview of his proposed Fiscal Year 2014 Budget and Financial Plan and to receive feedback from residents. The first ward-based meeting will be held in Ward 5 on April 10 at Luke C. Moore Academy, located 1001 Monroe St. NE. The meeting will take place from 6:30 p.m. to 8:30 p.m. Please be advised that Precinct No. 70 will be relocated from Burroughs Elementary School, located at 1820 Monroe Street, NE, to the Perry Street Prep PCS at Taft, located at 1800 Perry Street, NE. The relocation is necessary because Burroughs Elementary School is under construction. Additionally, Precinct No. 77 will be relocated from Delta Towers Apartment, located at 1400 Florida Avenue, NE to the Joseph H. Cole Recreation Center, located at 1299 Neal Street, NE. This relocation was necessary because BOE has received numerous complaints about the inadequate space and long lines at Delta Towers. BOE will notify all registered voters in the precincts of these changes. Residents should also note the ballot request deadline of Wednesday, April 17, 2013. One Judiciary Square is the only Early Vote Center open for this Election. It is open from Monday, April 8 until Saturday, April 20 from 8:30 a.m. until 7:00 p.m. Voting will not take place on Sunday, April 14th, & Tuesday, April 16th, D.C.’s Emancipation Day. The Department of Public Works (DPW) announced today that its next monthly Household Hazardous Waste/E-Cycling/Personal Document Shredding drop-off is Saturday, April 6, between 8 a.m. and 3 p.m. at the Ft. Totten Transfer Station. To safely dispose of batteries with lithium or batteries of greater than 9 volts, put clear, masking or electrical tape on the batteries’ terminals or sandwich the batteries between two layers of tape (e.g. flat button cells). These batteries should be placed in a container separate from other batteries that don’t require taping. DPW will accept household hazardous waste and e-cyclables only on the Thursday before the first Saturday of the month (April 4, from 1 p.m. to 5 p.m.). While DPW normally offers personal document shredding during the Saturday event, items for shredding cannot be accepted on Thursdays because these documents cannot be protected until the shredding contractor arrives on Saturday. Click here to view a list of all household hazardous waste and e-cyclables accepted by DPW. In its third year as an Arbor Day Foundation partner, Pepco is providing 2,000 free trees to customers in Maryland and the District of Columbia through the Energy-Saving Trees program. Launched as a pilot initiative in 2011, the Energy-Saving Trees program conserves energy and reduces household electricity bills through strategic tree planting. Pepco customers can reserve their free trees today at www.arborday.org/pepco. Monday, April 8 – The Queens Chapel Civic Association meeting will take place at the Union Wesley AME Zion Church, located at 1860 Michigan Avenue, NE, beginning at 7:00 p.m.
Tuesday, April 9 – The Arboretum Neighborhood Association meeting will take place at the Arboretum Community Center, located at 2412 Rand Place, NE, beginning at 7:00 p.m.
Tuesday, April 9 – The Trinidad Neighborhood Association meeting will take place at the Trinidad Recreation Center, located at 1310 Childress Street, NE, beginning at 7:00 p.m.
Tuesday, April 9 – ANC 5D will hold its monthly meeting at the 5th District Police Station, located at 1805 Bladensburg Road, NE, beginning at 7:00 p.m.
Wednesday, April 10 – ANC 5B01 and PSA 503 will hold its monthly meeting at the Hospital for Sick Children, located at 18th and Bunker Hill Road, NE, beginning at 6:30 p.m.
Thursday, April 11 –The Woodridge South Central Community Association meeting will take place at the New Canaan Baptist Church, located at 2826 Bladensburg Rd, NE, beginning at 6:30 p.m.
Monday, April 15 –The Bloomingdale Civic Association meeting will take place at the St. George’s Episcopal Church, located at 160 U Street, NW, beginning at 7:00 p.m.
Tuesday, April 16 – The Ward 5 Council on Education meeting will take place at the Lamond-Riggs Library, located at 5401 South Dakota Ave, NE, beginning at 7:00 p.m.
Monday, April 15 –The Brookland Civic Association meeting will take place at the Brooks Mansion, located at 901 Newton Street, NE, beginning at 7:00 p.m.
Tuesday, April 16 – ANC 5E will hold its monthly meeting at the Summit, located at 116 T Street, NE, beginning at 7:00 p.m.
Wednesday, April 17 – ANC 5C will hold its monthly meeting at the 5th District Police Station, located at 1805 Bladensburg Road, NE, beginning at 7:00 p.m.
Wednesday, April 17 – ANC 5A will hold its monthly meeting at the Potomac Lighthouse PCS, located at 4401 8th Street, NE, beginning at 6:30 p.m.
** Councilmember McDuffie’s public schedule is subject to change. 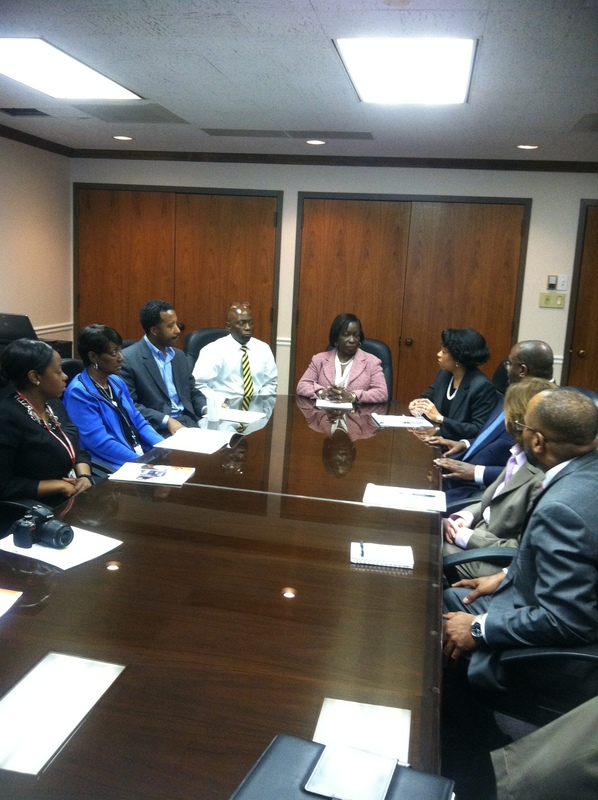 For more information, please visit www.kenyanmcduffie.com or contact our office at (202) 724-8028. Follow Councilmember McDuffie at twitter.com/CM_McDuffie and/or facebook.com/KenyanRMcDuffie. Update your subscriptions, modify your e-mail address, or stop subscriptions at any time on your Subscriber Preferences Page. You will need to use your e-mail address to log in. If you have questions or problems with the subscription service, please contact support@govdelivery.com. All other inquiries can be directed to dcdocs@dc.gov. This service is provided to you at no charge by the District of Columbia.